The Link Electronics 11801080 is a multiplexer de-multiplexer for embedding and de-embedding AES audio onto an SDI signal. Audio is embedded onto the SDI video signal for single cable AV distribution. This function allows high quality signals to travel long distances on one cable for economic and space considerations. The 1180 is designed to insert analog or digital audio signals onto a single SMPTE 259M serial component digital video signal. The audio signal will be placed onto the SDI video according to SMPTE 272M-1994. 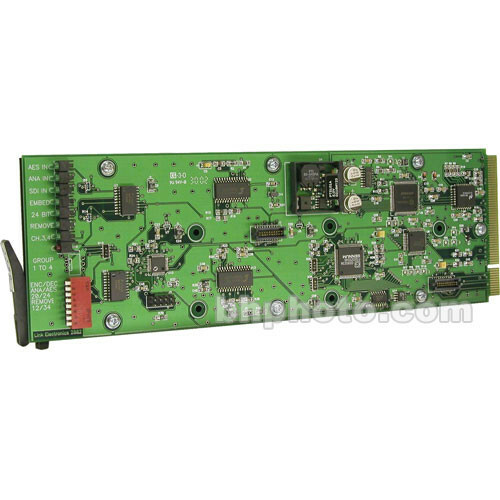 This unit is designed to extract the digital audio signal from a single SMPTE 259M serial component digital video signal. The demultiplex function reads the AES/EBU audio signal and sends the data in AES format out the digital audio output port. 20 bit or 24 bit audio can be selected; 75 ohm unbalanced and 110 ohm balanced audio are supported. Multiple channels can be embedded and de-embedded. Digital NTSC (525/60) and PAL (625/50) television systems are supported for signal acceptance and reproduction. This card was design to fit into the 1000 series rack card chassis or the 7200 single card chassis.